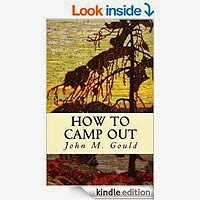 Mr. Gould provides the prospective camper with valuable advice covering the logistical, psychological, and social aspects of camping. One of my favorite pages is a list of necessities (which, the author cautions, "is by no means exhaustive") that includes first-aid supplies, shingles (to be used as plates), beeswax, a bean-pot, and even a Bible! In a reflection of his military experience, he devotes part of the text to the importance of the division of labor in the camping party and the requirements of leadership in the person chosen as group captain.